Annuity income falls by up to 16.2% in the last year as fears of a global economic slowdown and falling oil prices sends equities into a bear market with fund values for people retiring lower. Equity markets around the world have reduced with the FTSE-100 falling 9.1% or 568 points since December to a low of 5,674. The FTSE-100 index reached a high of 7,122 in April 2015 and since has reduced by 20.3%. The recent falls are due to investor fear of a global economic slowdown and the lowest oil price since 2003. At the same time annuity rates have reduced due to the uncertainty and new legislation called Solvency 2. For people retiring that remain invested and tracking the FTSE-100 index before taking benefits they will have a smaller fund for the annuity. This would result in a significant decrease in income for their lifetime and the only way to benefit from a recovery would be flexi-access drawdown. Annuity rates have been falling since reaching a recent high in June 2014. For our benchmark example 65 year old with a fund of £100,000 buying a single life, level annuity the income was £6,143 pa and has reduced by £565 pa or 9.2% to £5,578 pa in the last eighteen months. Annuities are based mainly on the 15-year gilt yields and these have reduced 114 basis points from 3.14% in June 2014 to 2.00% in January 2015. As a general rule a change of this amount would result in annuity rates reducing by 11.4% suggesting rates could reduce further. 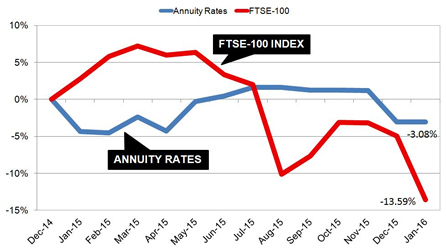 The above chart shows since December 2014 the FTSE-100 index has reduced by 13.59% and annuity rates for our benchmark example is lower by 3.08%. The combination of both these falls can make a significant reduction in the lifetime income to someone retiring today. Using our benchmark example, for someone with a fund of £100,000 in December 2014 could receive an income of £5,755 pa. By delaying buying an annuity and remaining invested their fund would have reduced to £86,410. 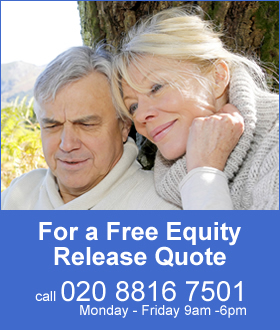 A lower annuity rate of 5.578% would apply today and mean they would receive £935 pa less income or only £4,820 pa. This is a fall in the annuity income of 16.2% for their lifetime. 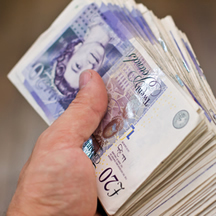 In terms of lifetime income, the Office of National Statistics (ONS) would expect a male to live for 17.3 years and he will have £16,175 less over his lifetime. For a female she can expected to live for 20.4 years increasing her income by £19,074. For people caught by the sudden fall in markets they could wait for a recovery in the equity markets. If you need to take your tax free lump sum now, it is possible to transfer to Flexi-access drawdown allowing access to funds while leaving your fund invested. You are allowed to take a 25% tax free lump sum or to take parts of this over time leaving the remaining fund in equities and time to recover. To reduce volatility a smoothed growth fund would allow the fund to continue growing at 5-6% each year while reducing volatility. Growth in the fund is based on long term expectations so short term falls in equities are balanced with periods of above average gains producing a smoothed return over time.